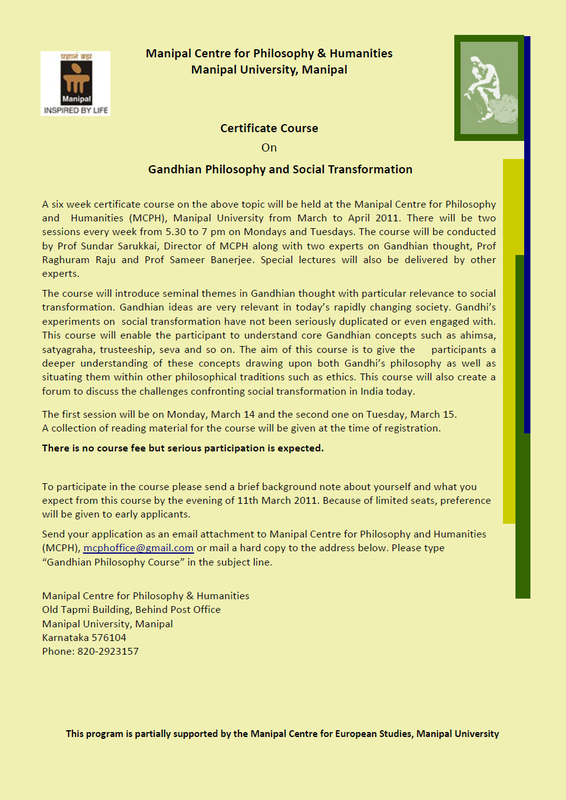 A six week certificate course on the above topic will be held at the Manipal Centre for Philosophy and Humanities (MCPH), Manipal University from March to April 2011. There will be two sessions every week from 5.30 to 7 pm on Mondays and Tuesdays. The course will be conducted by Prof Sundar Sarukkai, Director of MCPH along with two experts on Gandhian thought, Prof Raghuram Raju and Prof Sameer Banerjee. Special lectures will also be delivered by other experts. The course will introduce seminal themes in Gandhian thought with particular relevance to social transformation. Gandhian ideas are very relevant in today’s rapidly changing society. Gandhi’s experiments on social transformation have not been seriously duplicated or even engaged with. This course will enable the participant to understand core Gandhian concepts such as ahimsa, satyagraha, trusteeship, seva and so on. The aim of this course is to give the participants a deeper understanding of these concepts drawing upon both Gandhi’s philosophy as well as situating them within other philosophical traditions such as ethics. This course will also create a forum to discuss the challenges confronting social transformation in India today. The first session will be on Monday, March 14 and the second one on Tuesday, March 15. A collection of reading material for the course will be given at the time of registration. To participate in the course please send a brief background note about yourself and what you expect from this course by the evening of 11th March 2011. Because of limited seats, preference will be given to early applicants. Send your application as an email attachment to Manipal Centre for Philosophy and Humanities (MCPH), mcphoffice@gmail.com or mail a hard copy to the address below. Please type “Gandhian Philosophy Course” in the subject line. This program is partially supported by the Manipal Centre for European Studies, Manipal University.